The time-keeping device that governs all aspects of our lives, the atomic clock, is celebrating its 50th year. The first atomic clock, which uses the resonance frequencies of atoms to keep extremely precise time, was born at the UK's National Physical Laboratory. Atomic clocks form the standard for Coordinated Universal Time (UTC), which governs legal time-keeping globally. The clocks are vital for rafts of technologies, such as global satellite navigation, and TV signal timings. Precise and accurate time-keeping is also essential for other synchronised events, such as the distribution and management of electricity, and financial transactions across the globe. 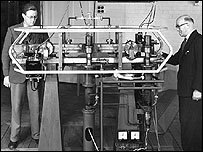 The first accurate caesium atomic clock was developed at the NPL in 1955 by Dr Louis Essen. But the idea was originally proposed by Lord Kelvin in 1879. He said that time-keeping based on how atoms behaved would be a better way to count time intervals than anything else. "Up until the introduction of the atomic clock, time definition was based on the rotation of the Earth," Professor Patrick Gill, senior fellow at the lab, told the BBC News website. "Whilst that was reasonable, it did show variations and the point about using the atomic clock idea is that you are using a frequency which corresponds to the difference in energy of the ground state of atoms - it is pretty accurate compared with astronomical arrangements." Atomic clocks are still much more constant than any other current method of time-keeping, although they are sensitive in a very small way to changes in electric and magnetic fields. The development of the atomic clock was partly helped by technological advances such as radar during World War II. In the 50 years since the first atomic clock started counting, the devices have grown to be more than 100,000 times more precise. Atomic time is crucial for a plethora of telecommunications and computing applications, such as coordinating packets of data which are transferred across the net, global positioning satellite (GPS) systems and mobile telephony. As net data is split in data streams and reassembled, for instance, the timing has to correct at the point of re-assembly. If not, whatever data has been sent - voice packets in VoIP net phone calls for example - will come out garbled. Now, using a beam of caesium-133 atoms, generated from a special type of oven, the best present-day atomic clocks are able to keep time to within a 10th of a billionth of a second a day. They do this by counting time based on the way cooled-down caesium atoms jump back and forth between different energy levels. This occurs at microwave frequencies, with nearly 9.2 billion jumps making up the interval of time known as the second. Atoms are cooled to narrow down the width of this "resonant frequency". The narrower that is, the more precise the measurement of time. 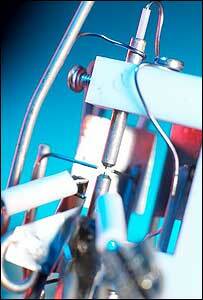 "Essen's initial idea made use of a horizontal beam of uncooled caesium atoms, which travelled across a metre or so. He probed this with a microwave signal at two points along the way," explained Professor Gill. The current atomic clocks still use this method, but in a different kind of set-up, known as an "atomic fountain". "At the bottom of the fountain you have a cloud of a million atoms which are cooled by lasers - typically to micro-Kelvin temperatures. "We give them a little kick from below; they travel up a metre in height and fall back down. We then take microwaves and probe them on way up and down. "From that double probing we can get a very narrow frequency." There are five or six standards labs worldwide which now have a similar fountain clock set-up, all contributing to UTC. There are a significant number of commercial atomic clocks in operation around the world, some of which also contribute to UTC, but they are not as accurate, says Professor Gill. The next step Professor Gill and his team - and several other groups globally - have been developing replaces microwaves with much shorter wavelengths of laser light. These optical clocks now under development operate at much higher frequencies and so allow for a much more precise description of time. It is possible that optical clocks may replace the current microwave clocks as the primary standard of time in a decade or so. Optical atomic clocks, therefore, have greater potential in improving the performance of global positioning satellite systems to the sub-metre level, according to Professor Gill. "The technology that uses the most accuracy it can get a hold of is satellite navigation," said Professor Gill. "What you have in the GPS satellite systems are rubidium and caesium clocks. Those satellites which provide the basis for triangulation to receivers on the ground are also monitored by ground stations. "Within those there are master clocks which are more accurate than the satellite ones. "That gives you typically some nano-seconds' timing accuracy on the ground and relates to a positional precision of a few metres or so." As optical atomic clocks develop, however, they may start to appear in ground stations, then in future generations of satellite systems, which then means sub-metre precision location, even when an object or person is on the move. This opens up all sorts of possibilities for the military, which heavily relies on GPS, as well as more everyday uses in civil transport and location activities. "There is even talk of importing receivers into mobiles and having tiny atomic clocks onboard mobile handsets," said Professor Gill. "They are not as accurate as caesium fountain systems, but they can be made small and could give local time for periods when your receiver could not see a satellite." In September 2004, the US National Institute of Standards and Technology (Nist) used computer chip fabrication techniques to make a small atomic clock. The final development should see a battery-operated system about the size of a sugar lump.